As Wikipedia explains: “Chow mein (/ˈtʃaʊ ˈmeɪn/) are stir-fried noodles, the name being an English language corruption of the Taishanese chāu-mèing.” Oh corruption, why do you taste so good? Delicious, delicious corruption, how you woo me with your noodley goodness. Corruption smerruption, whatever this is, it is a damn fine dish, and I have no problem chowing down, 2 heaping bowls of this veggie packed noodle bliss. (See what I did there). Did you know that cabbage is a super healthy food. Low in calories, high in vitamins C, and K, and receives 5 stars on both the weight loss and optimum health scales on Self Nutrition Data. Adding a monster amount of cabbage to this recipe is a sneaky deaky trick, because it’s not only delicious, but it blends right into the noodles, meaning you are getting more nutritional bang for your noodle buck. Yes, bring on the veggies! 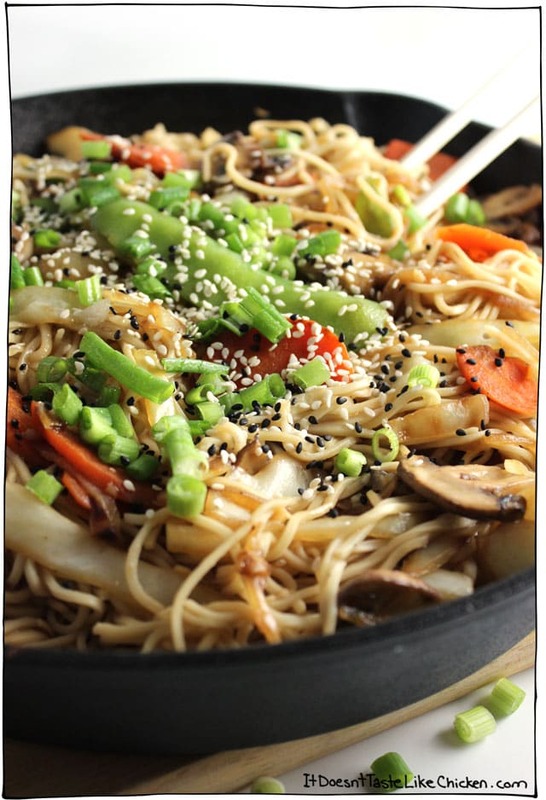 This is one chow mein recipe that is good for you. Are you drooling over your keyboard yet? If you like this recipe or any other recipes or posts on It Doesn’t Taste Like Chicken, perhaps you could be my friend nominate me for the SAVEUR Blog Awards, and help me get all my hard work recognized. You can do so by clicking here. Thankyouthankyouthankyou! You’re my favourite. Back to noodles. Bring a large pot of water to a boil and cook the chow mein noodles according to the package directions. When you are shopping for chow mein noodles make sure to get the egg-free kind. In my grocery store, both the egg containing chow mein noodles and the egg free kind are right beside each other in the Asian section of the grocery store. 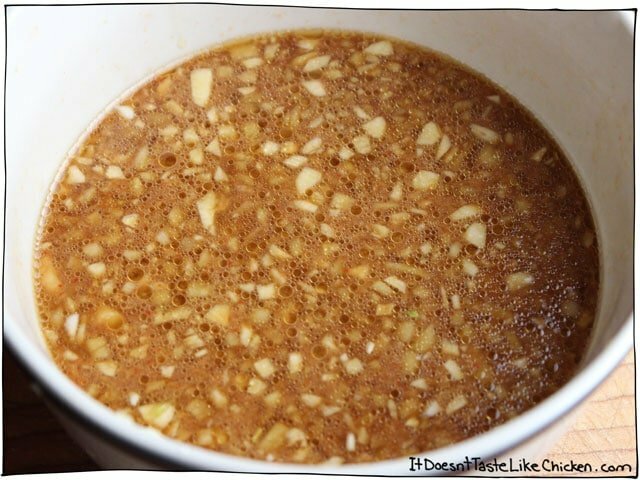 Now mince your garlic and ginger and add it to a small bowl along with all the other chow mein sauce ingredients. Then set that bowl aside. I keep the favours fairly light here as I know not everyone is as obsessed with soy sauce and Sriracha as I am. The good news is you can always set your mouth into a salty fire by choice in your own bowl, while someone else can decide not to destroy their taste buds. Chop up all your veggies. I think mushrooms are a key ingredient because I love mushrooms, but Andrew doesn’t think they are key because his mushroom love isn’t as strong as mine. I will leave the decision up to you. Now get a pan nice a hot, and sauté the cabbage and onions in a bit of oil. Am I the only one who thinks that cooking cabbage and onions smells like cooking potato pancakes for no apparent reason? I am going to go ahead and say I am the only one. When it’s all delicious, golden and wilted, dump the cabbage and onion mixture into a bowl and set aside. 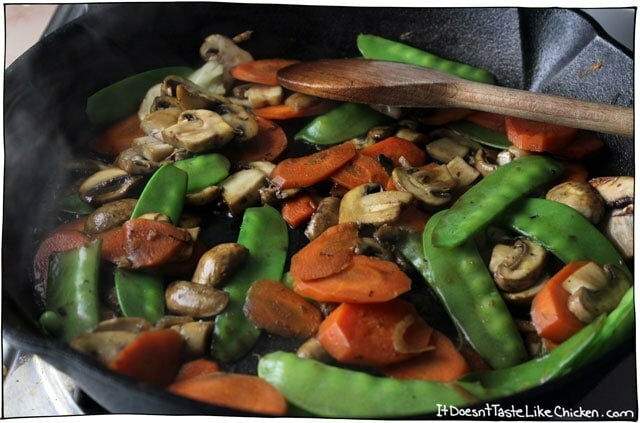 Add the pan back to the heat, and sauté the mushrooms, carrots, and snow peas. Cook these guys for about 5 to 10 minutes until they are cooked through and the mushrooms release their awesome juiciness. Toss in the chow mein sauce and cook for just a minute more. Add in the cabbage and onion mixture, and the cooked noodles, and toss well to combine. 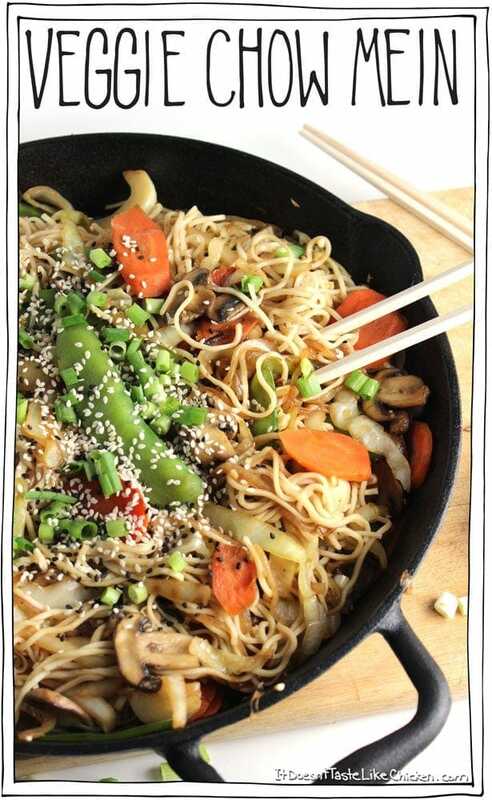 Garnish with green onions and sesame seeds and feast your way to noodley paradise. 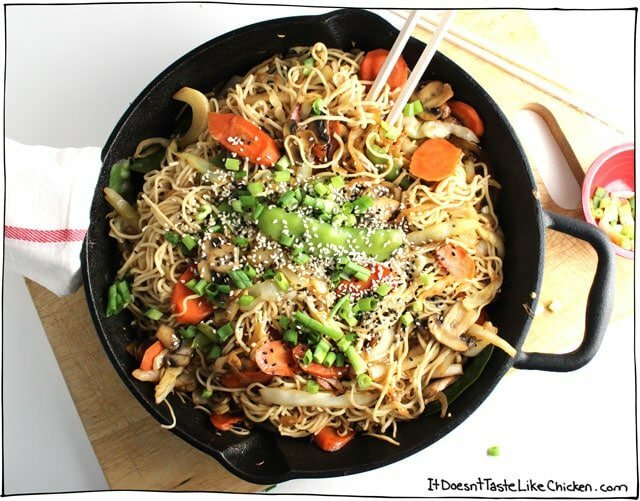 Healthy and vegan, Veggie Chow Mein! Adding a monster amount of cabbage to this recipe is a sneaky deaky trick, because it’s not only delicious, but it blends right into the noodles, meaning you are getting more nutritional bang for your noodle buck. Yes, bring on the veggies! This is one chow mein recipe that is GOOD for you. Bring a large pot of water to a boil and cook the chow mein noodles according to the package directions. Drain and set aside. Add all of the sauce ingredients to a bowl and mix together. Heat the oil in a large pan over high heat. When the oil is hot, add the cabbage and onion. 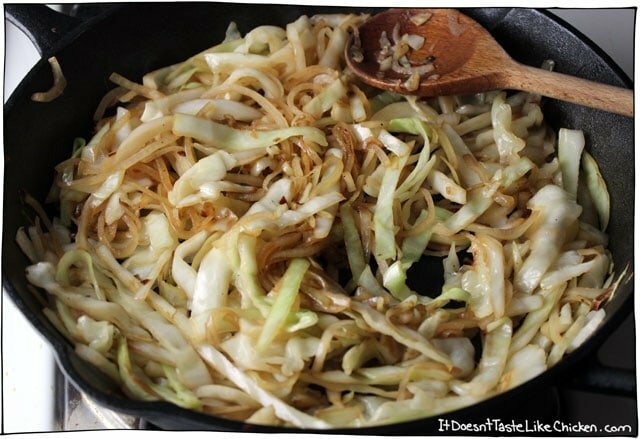 Stir frequently until the cabbage and onion have reduced in size and are nicely browned, about 5 minutes. Remove the cabbage mixture from the pan and set aside. Return the pan to the heat. Add more oil if needed and then sauté the carrots, peas, and mushrooms for 5 to 10 minutes, until softened and cooked through. Add the chow mein sauce to the pan, and cook for about 1 minute longer. Now add back the cooked cabbage and the noodles to the pan. Toss everything to combine. Garnish with green onions and sesame seeds. Feature Ingredient: Cabbage. 97 Days, 48 Recipes to go! Can you share what brand of noodles you used or like to use? This was amazing!! I decided to use rice instead of the noodles yet I found some crunchy Chow Mein noodles to put on top. I also added some water chestnuts. Super yummy! Your recipes are the best. I have your cookbook and every recipe is superb! Hope you will have another one in the future! Thank you for sharing all of these delicious recipes!!! I didn’t find it to have much taste. What about sauting in a little sesame oil and not canola oil. Omg. This wasn’t just bad. It was disgusting. I tried it twice, thinking I must have done something wrong. Nope. The liquid with the cornflour solidified before the garlic or ginger cooked. Both times. Gross. I threw it out, both times after one bite. Mmmmm. So good! Asian food is hard for me to make good but this is delicious. In eating my second serving as I write this. Should have stopped after 1 serving but couldnt resist! Ive made I think 4 of your recipes so far and shared your site with my sister in law and she made 3 recipes and verything weve made has been amazing! Hi! Looks yum! Sadly I can’t find vegan chow mein noodles…but I do have some organic soba noodles on hand! Could I use those instead? Thanks! So good. I had Chinese cabbage so that’s what I used. Love chow mein noodles so I’ll be coming back to this again and again. Thank you! OMG just made this and it’s amazing! I opted for no mushrooms because I don’t like them and it was still so good! Thank you so much for the recipe! Next, I’m going to make the fried rice from your book. Hi Sam. My daughter is vegan, and I’m always in search of a good recipe. We tried this one last night for dinner and so so good. I made extra so we’d have leftovers, but we opted for seconds instead. LOL We tried the nacho cheese last night too. Wow!! My daughter is so excited that I found you. 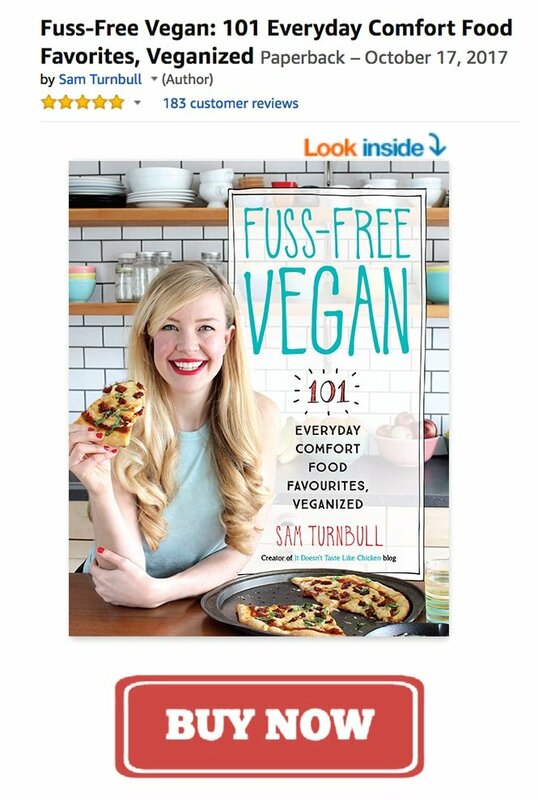 I’ve ordered your book and have a list of recipes lined up and can’t wait to try them. phenomenal recipe. Fairly new to veganism, went overnight kinda like you actually lol. watched earthlings. been using your site as my cookbook for awhile now actually. this is my favorite dish so far 🙂 keep it up. Hi! I would love to cook this for my family but my daughter is allergic to milk and I haven’t find chow mein noodles that don’t have milk or traces of it. Do you know any brand that’s milk-free? You could try googling “vegan grocer” in your area to see if they stock vegan chow mien noodles. Any vegan store would have some kind of thin vegan noodle you could use. In the supermarket I found Chang’s long life 98% fat free noodles to be egg and milk free. I sometimes use angel hair pasta as a thin noodle substitute, obviously it has to be boiled first. The only ingredient in angel hair pasta is wheat. tried this a few months ago, forgot to comment though. it was amazing, i haven’t made chow mein as delicious as this before! 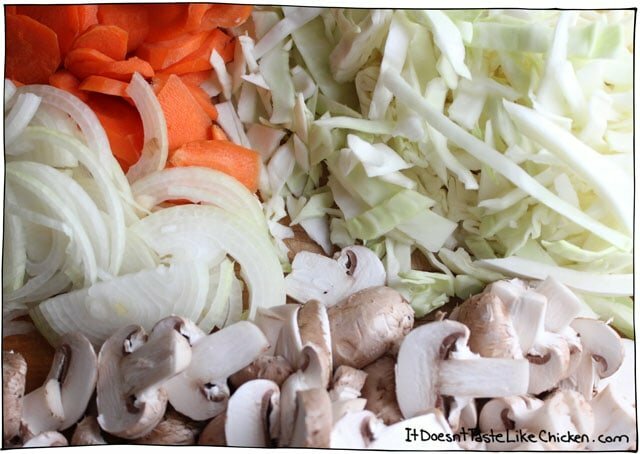 Looks and sounds so delicious I will be making this and your veggie fried rice very soon. I just have to add coconut milk now to my ever growing pantry list. We found the silken extra firm tofu right where you said it would be and black salt from BJ’s is ready to go for our weekend breakfast of vegan champions! Rah, Rah! BTW, I had the Singapore noodles at Kings Café and just assumed it was eggless. No? Hi Linda, I recognize you from Food Blogger Pro! I hate greasy noodles, their the worst. I hope you enjoy the recipe. Bon Appetegan! I’ll take noodles in any form…especially loaded with veggies so i can eat more 🙂 Awesome photos..have loved these on Pinterest! After coming to your blog, I actually remember it from the photos…isn’t that something? Shows how memorable they are! Cabbage is one of those veggies I almost never thing of to use, but it so yummy! I even love gnawing on it raw. Thank you so very much Jess! Enjoy! Very much appreciate it, thank you peawry! Aww shucks thanks Carrie! Thank you for being a reader and the for the nomination! Love your recipes (a very special thank you for the sriracha cauliflower). Love your blog. Nominated you!